A new weapon from Hearthstone's upcoming expansion, The Boomsday Project, has been unveiled. 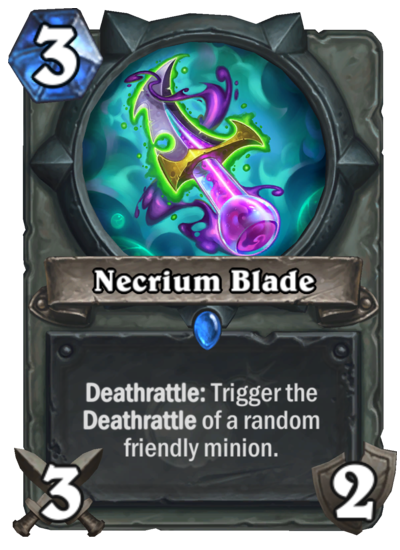 Necrium Blade is a three-mana Rogue weapon with three attack and two durability. It has a Deathrattle ability that allows you to trigger the Deathrattle of a random friendly minion. At first glance, it's unclear how useful this card will be in the meta that follows the release of the new expansion—it's difficult to judge Necrium Blade when all of the The Boomsday Project's cards haven't been revealed yet. If this card is used, it'll most likely be best served in a deck with plenty of minions that have Deathrattle abilities. Some Rogue minions with Deathrattle effects that Necrium Blade could take advantage of include Cursed Castaway, Kobold Illusionist, and Bone Baron. Other neutral minions, such as Cursed Disciple, Lost Spirit, Loot Hoarder, and Silver Vanguard, could also have their Deathrattle abilities triggered by this weapon. The Boomsday Project is the second Hearthstone expansion of the current Standard year, the Year of the Raven. The set will add 135 cards to the game, including new keywords like Magnetic. This expansion can be preordered, and all of the cards will become available on Aug. 7.